This tab allows you to register your product after purchase. To do so (YOU MUST BE ONLINE), please have in hands the email account used during the registration process and the activation key provided by Kwiksher’s website. Enter (or paste) them into their respective Email and Activation Key fields. When you click OK, Kwik will validate your records against the database. If it validates the data and verifies you still have rights to activate a copy (you can install Kwik in up 2 different machines), your plugin will be registered and you are going to receive a confirmation message. If the registration process fails, an alert will show. UPDATE: Some users cannot register online due, which seems to be area related firewall issues. If you are affected by that, send an email to support@kwiksher.com with the number showed in the Registration tab (in the example above the number is 273). With this information I will create your serial number manually. 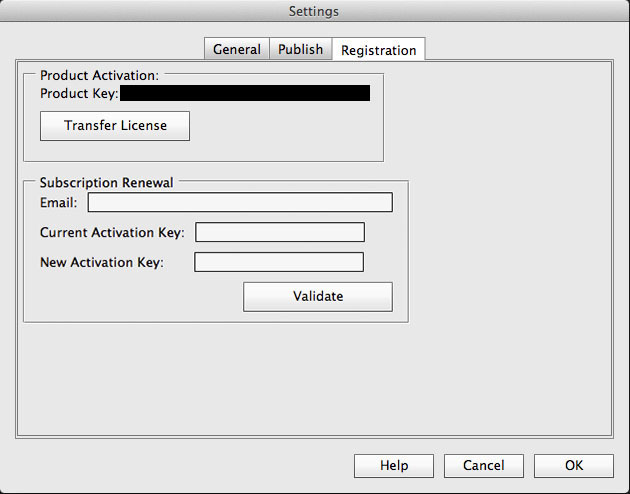 IMPORTANT: Kwik Activation Key is different than Kwik 2 Activation Key. If you are a Kwik 2 user willing to use the new version, you will need to pay for the upgrade. After registered, coming back to this tab will show your serial number. TRANSFERRING LICENSE: Users are able to discard a serial number (in order to get a new one to use in other machine), just pressing the new Transfer License button in the Registration tab. Doing so, the current serial number will be discard within Kwiksher’s database, allowing the user to use another registration in another machine. You can transfer 4 times only. This was a request from several users switching between machines. IMPORTANT: You don’t need to transfer a license if your new machine will use the same Photoshop from the older one, as Kwik will automatically use the previous serial number in this case. Kwik will process your request and, in case of success, it will extend your days. IMPORTANT: Do not use the new activation key before this step. If the new activation key was already used, Kwik will not be able to associate it with with your current one.